The playlist includes cuts from Vassil Naidenov, Tramway No. 5 and more. In the late ‘70s, the uplifting sounds of disco graced dance floors all over the world. The genre’s epic strings, cheerful vocals and futuristic synths transcended the realm of western culture, even reaching beyond the Iron Curtain—and into Bulgaria. It wasn’t just the music of Gloria Gaynor, Cerrone, Boney M and Supermax that was echoing in the Eastern Bloc. In Bulgaria, western hits and Bulgarian-language versions of American and European songs were on rotation alongside Bulgarian disco originals. And as the musical style grew in popularity, a myriad of local artists fed fans with synth heavy hits. Pop stars like Mimi Ivanova, Rossitsa Kirilova, Georgi Hristov, Trik, Tramway No. 5, Kristina Dimitrova, Blagovest and Svetoslav Argirovi opened a new chapter in Bulgarian music history, releasing a number of timeless disco gems. And while the golden age of Bulgarian disco sadly ended with the fall of the Berlin Wall, the legacy of the music lives on. To introduce you to the sonic bliss of Bulgarian ‘70s and ‘80s disco, we’ve selected a colorful palette of obscure tracks and hands-in-the-air anthems by some of the country’s most important disco stars. Take a crash course below. Undoubtedly one of the biggest superstars of Bulgarian pop music, Mimi Ivanova has won the hearts of a few generations with her silvery, high-pitched voice. 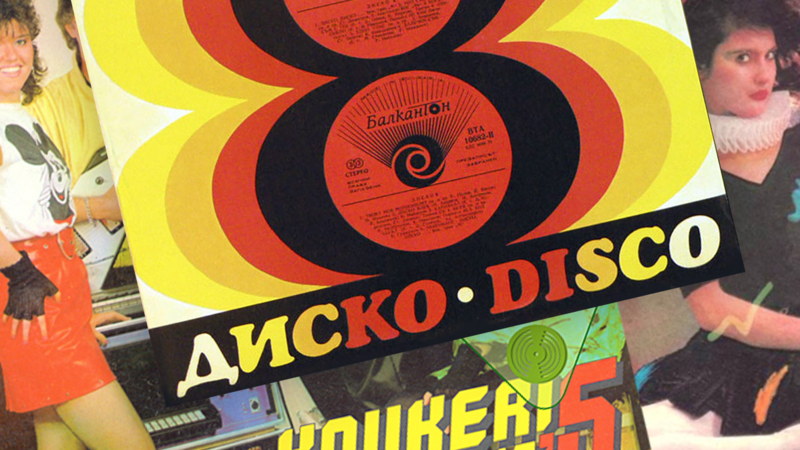 This track, which translates to “disco rocket,” is one of the earliest Bulgarian cosmic disco releases. Five minutes of pure sonic bliss. In 1979, the first Bulgarian cosmonaut, Georgi Ivanov, was launched into space as part of the Soyuz 33 mission. To celebrate the occasion, the Ensemble of the Bulgarian National Army released a special record, named Звезден Миг (“star moment”). The track “Звезден Диско Танц, which means “a star disco dance,” is just what its lyrics suggest—”an eternal star kozachok”. Sofia native Vassil Naidenov made his first steps on stage as a vocalist for the legendary Bulgarian rock band Diana Express, though he’s most famous for his anthemic solo songs. Now the pop star, who’s in his late 60s, is still actively touring and his songs are just as relevant. Tramway No. 5 is easily one of the most loved Bulgarian pop acts from the ‘80s. Known for their incredible presence on stage, the band’s memorable TV appearances influenced some of the first video clips in the country. Taken from the compilation Disco vol.9, ‘Синя Вечност’ (“blue eternity”) is a beautiful cosmic disco tune, soaked in Tramway No. 5’s trademark euphoric sound. One of the pioneers of disco and synth pop in the country, the twin duo Argirovi rose to stardom with their debut album, Момиче за двама, in 1983. The album’s eponymous track is a synth pop anthem, which still sounds just as good today as it did then. Known for her anthemic cover version of Irene Cara’s “What A Feeling”, Veneta Rangelova was a poster child of Bulgarian disco and dance music in the ‘80s. Charismatic, talented and stunning, Veneta was destined to succeed. But her reign was short and sweet as she left the stage at the peak of her fame to focus on her family. Though Roxana Beleva released just one album, she definitely left a mark in Bulgarian pop music. Her synth pop hit “Песента на щурците”, which translates as “the song of the crickets,” has been covered by more than one Bulgarian singer over the years. Its enduring popularity has proven that good music is ageless. Rositsa Kirilova’s larger than life anthem “Боса по асфалта” is the embodiment of the feel-good vibes Bulgarian disco channelled in the ‘80s. In this catchy disco tune, Kirilova sings about the childlike innocence of walking barefoot on the city’s streets. It hardly gets any better than this. True masters of obscure and synth-heavy melodies, Trik certainly have the magic touch when it comes to unforgettable disco hits. Besides, their avant-garde looks and synched choreography never failed to take their performances to the next level. Kristina Dimitrova and Orlin Goranov earned their place in the pantheon of great Bulgarian pop artists. There’s an incredible harmony in their voices—and they produced some of the country’s most timeless songs. Named after a carnival ritual where costumed men dance in the streets to chase evil spirits away, Koukeri are, without a doubt, worthy of their name. The band, which released as many as six albums in the ‘70s and the ‘80s, are true masters of forging the perfect disco song. The aptly named “Песничка” (“little song”) sees them at their best, reaching the perfect balance between melodic pop and synth-heavy disco. A late ‘80s synth pop stomper, “Приземи се” (“land”) was produced by Bulgarian supergroup FSB. In addition to its neat production, the track also boasts idyllic lyrics written by one of the country’s most famous modern poets, Evtim Evtimov. Absolute gold.